The mouse is death!! This is a phrase I’ve heard, in reference to one working efficiently on his computer. What it means is, given the choice between using your mouse to execute commands vs. using keyboard shortcuts to execute commands, it is often times quicker to use keyboard shortcuts. I’ve found this rule of thumb to be true when using different computer software applications, including when using AutoCAD. As a help to anyone interesting in learning keyboard shortcuts, I’ve created the AutoCAD Cheat Sheet. It is a list of what I consider to be the most useful command aliases for doing generic drafting in AutoCAD. If you don’t know, the command aliases are AutoCAD command keyboard shortcuts. Click the cheat sheet to see it in full size. Right click on the cheat sheet, and then select “save image as” for saving it to your computer. I went through the acad.pgp file to create this cheat sheet. The acad.pgp file is the program parameters file. It contains the external command and command alias definitions. To find out more about the acad.pgp file, go to your AutoCAD Help. Tip: The F1 key is the keyboard shortcut for launching AutoCAD Help. 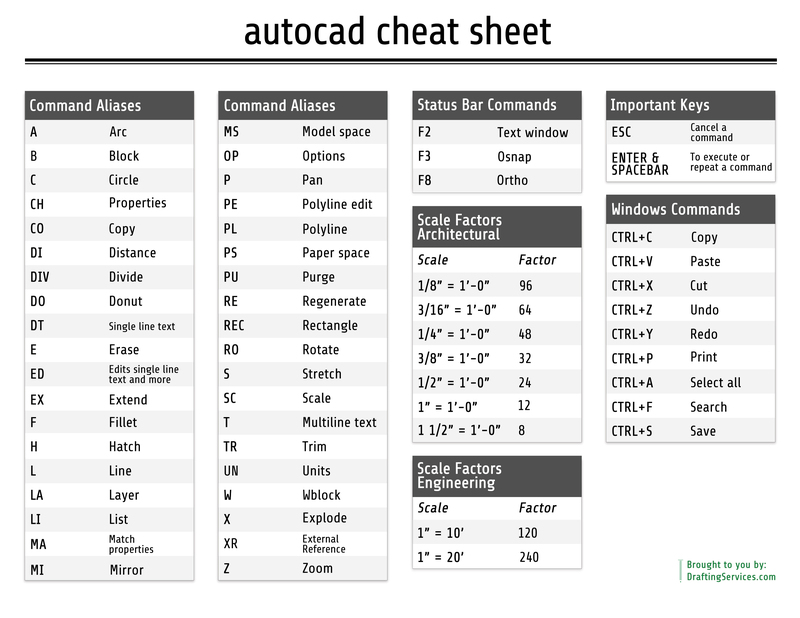 The AutoCAD Cheat Sheet is free, so use it as you please! Aside from aiming to include the most useful AutoCAD keyboard shortcuts, I also tried to make the sheet readable at an arm’s length, in black and white printed format. I’d love to hear what you think about both the content and format of the sheet, so please feel free to share your thoughts via the comments below. Be efficient by working smarter. I hope this sheet is a means to that end! Happy cadding!! Thanks! Just what I needed. Perfect Size and not complicated. You could check out shaan hurley’s blog for useful AutoCAD related posts that are very useful. Thanks for the sheet. Am refreshing and practicing Cad related programs… just by one glance helped me recall the basic commands. Can the scale factors be done in Metric? Also scale factors for Land Surveying and City Planning designs in Metric for scales like 1:1000, 2000, 2500, 5000, 7500, 10,000 and 15000? Thanks Albert. Good idea. If things slow down for me, then I may do metric. I’m glad you can use it Abi. You’re welcome Lucy. Glad to hear you like it.